Let's admit it: we all get giddy over beauty products but never over cleaning makeup brushes. For me, it's a chore but something I have to do on a regular basis for hygienic purposes. I have tried a lot of methods on how to clean makeup brushes, but nothing made me super excited about getting my brushes cleaned than this. I have tried the good old baby shampoo, the homemade formula of dishwashing soap + olive oil mixture (which I sooo regret now), and using tea tree oil cleanser from Body Shop. If I had to choose the "best" and "effective" way from these three it'd have to be a tie for good old baby shampoo because of how soft the brushes become afterwards and tea tree oil cleanser because it is moisturizing and with an anti-bacterial formula too. The reason I was still on a hunt despite this is I wasn't content with how these methods work in terms of removing product stains and hard-to-remove gunk from brushes. Then enter ENKORE MAKEUP BRUSH SOAP. After wetting the brush with warm water, swipe using back and forth motion onto the soap until it forms a lather. For deep cleansing, rub the brush against the sponge at the back. Tadah, squeaky clean brushes in no time. I was so impressed with how hard-to-remove gunk like foundation and lipstick came off easily and the stains from blush and powder foundation are now gone. Woot, woot! There are a lot of choices too, you can go scented or unscented, dye or sulfate-free so it's one thing less to worry about. It does its job well and quick so cleaning my brushes took me only minutes. It's so easy to rinse off too. I was told that it cleans way too much that it tends to dry out brushes, but I didn't experience it first-hand. Looking at the ingredients list, it shouldn't be the case since it has argan oil and maracuja seed oil. Anyway, I also dab the brushes onto a bit of tea tree oil cleanser to make them soft, just in case. While the brush soap is already anti-bacterial, it wouldn't hurt to dab some tea tree oil as well. I use vegan/synthetic brushes, by way, but the product claims to be effective for natural hair brushes too. Another boo-boo is it is not readily available in Singapore, so I had to order it from the US and have it shipped. 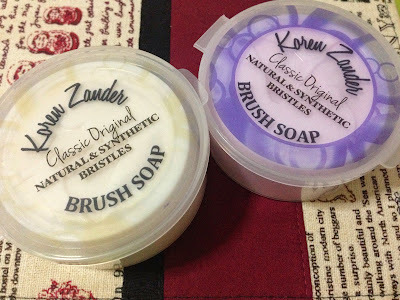 Brush Soap in Coconut and Lavender. The label says "Koren Zander", the creator of Enkore Makeup. Soap on one side, loofah on the other for deep cleansing. 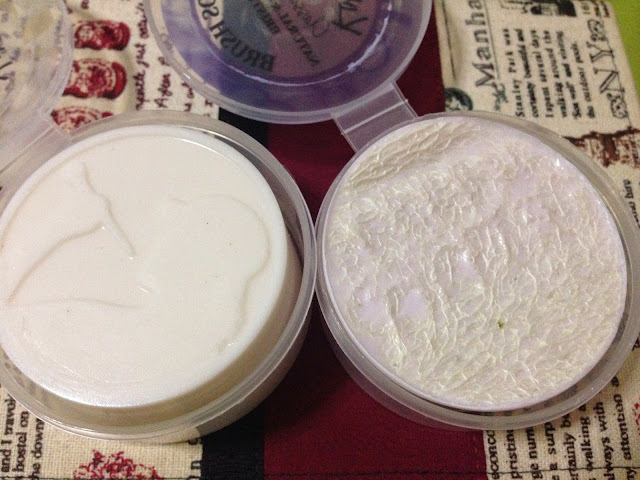 There are also a few brush soaps available in the market - and I am particularly interested to try the Makeup Store makeup brush soap in the future because it's getting raves online too. But for now, I'm happy as a bee with this product. Actually, I'm starting to get excited about cleaning my brushes again, too. I bought my brush soaps online from the Enkore Website.